Peterborough, Ont. – Brothers Darren, Ryan and Dr. Jarrod Goldin credit much of their success in life to a mantra instilled in them by entrepreneurial parents. Growing up in South Africa, they were told to “follow your dreams as crazy as they may be”. 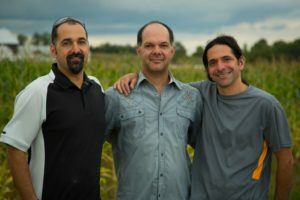 That advice has served them well: today, the three brothers run Entomo Farms, an insect business north east of Toronto. Darren and Ryan had begun with an earlier business supplying insects as reptile food. Jarrod had always hoped to work alongside his brothers and after watching an applicant on the show Shark Tank promote a cricket-based energy bar, they began contemplating producing insect protein for human consumption. Today, Entomo Farms (named for the Greek work for insect) sells both roasted and powdered crickets and mealworms. These sustainable, alternative protein sources are high in protein, iron, calcium, amino acids and omegas, and low in fat. Raising them also requires less food, water and space than traditional proteins. The Goldins started in 2014 with a 5,000 square foot facility. They’re now at 60,000 square feet, with another expansion in the works. With start-up assistance from both government and private funding, they now ship product all over the world. So what do crickets taste like? It’s a question they’re asked a lot. When the powder (flour) is incorporated into baking, there is a subtle nutty flavour to the recipe – if it’s noticed at all. The roasted ones are said to taste a lot like potato chips or roasted nuts. Their website contains recipes developed both by their own chef and their customers. There’s French onion soup with cricket powder, cricket powder pancakes, cricket caramel cheesecake and hundreds of other options. In the early days, the brothers answered a lot of questions about the “icky” factor of eating crickets. After all, eating insects is new to most of North America. But in a world where over two billion people already eat insect proteins daily, perceptions here at home are rapidly changing. It may seem like a career shift for Jarrod, a chiropractor by training. But he’s always been interested in health and sustainable nutrition. “There’s a great irony in the fact that we have a food system that’s never cared about health and a health system that’s never cared about food. We aim to change that,” he says. It’s a fully integrated business. 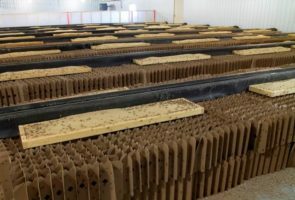 The crickets are raised in retrofitted chicken barns where “cricket condos” provide dark and comfortable quarters and a constant source of food and water. Eggs are collected and hatched with the insects harvested at six weeks of age. They’re then washed and roasted or processed into flour. Even the manure (called frass) is sold to gardeners as an organic fertilizer. 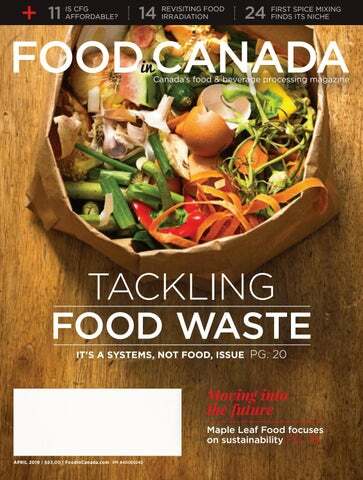 Recently, Entomo Farms won the Start Up Canada national award for sustainable development. They’ve received funding in part through Growing Forward 2 (GF2), a federal-provincial-territorial initiative. The Agricultural Adaptation Council assists in the delivery of GF2 in Ontario. 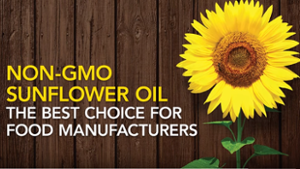 This article is provided by AgInnovation Ontario, a project of the Agri-Technology Commercialization Centre (ATCC). The ATCC is funded by Growing Forward 2, a federal-provincial-territorial initiative.